Welcome to Amritsar Portal - Home to the Golden Temple and now a Portal for the Punjab and Sikh Community. 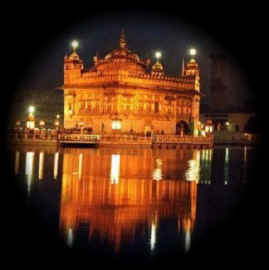 Amritsar, literally meaning "holy pool of nectar" is the spiritual and cultural centre of the Sikh Religion. The Golden Temple, also known as Sri Harmandir Sahib was initiated by the fourth Guru of Sikhs, Guru Ramdas Jee and completed in 1601 by his successor Guru Arjan Dev Jee. There is such a spiritual embodiment of the higher being that even the non believer is seduced by the hypnotic melody of the Paath. Listen to it and all your sorrows will be washed away and you will reveal your own inner spirit. Oh Ye of little faith, release yourself from your day to day suffering and embrace the true Guru. Listen to the immortal story of bliss on Paath. Amritsar is now the Gateway to Punjab and North India with the Raja Sansi International Airport offering Amritsar Flights to Delhi, Birmingham and London on Jet Airways Flights, Turkmenistan Flights, Uzbekistan Flights and Air India Flights. Join us and help to further the cause of the Global Punjab and Sikh Community. The Amritsar Portal website is a free website, run by a group of volunteers in the UK. We offer this website to the worldwide community as our Seva. We are not connected in anyway with any other Gurdwara or Community. We are not associated with the SGPC or Sri Harmandir Sahib community. We do not ask for and do not receive any financial contribution from any other community or body. Therefore we are independent and are not responsible for the actions or otherwise of any Gurdwara, SGPC or any other Committee and cannot answer for them. All rights reserved. All content is copyright � 2007. Amritsar Site Map.